Kebabs are the fast food of the east, and have migrated over to the west where they are a popular choice for an after the pub snack all over the UK. Kebabs and Turkish cuisine is also popular in Germany, due to the high Turkish immigrant population. Different types of kebab need a different way of cooking, uses of different meats and other ingredients, and the various types need different herbs and spices too. Each type of different kebab has a different aroma and taste. What Are The Different Types Of Kebab? The most popular and famous kebab in the UK is probably the ubiquitous Doner Kebab, fast food is loved by pub goers and hungry fast food lovers alike.The Doner Kebab is usually made of lamb but can be made with chicken sometimes. The meat is slowly roasted on a vertical rotating spit, and the Doner Kebab gets its name from the translation ‘Turning Roast.’ Doner kebabs are usually served with pitta bread and some sort of salad, with a dressing of chilli sauce or some other condiment. Nutritionally, the Doner Kebab is one of the unhealthiest fast foods to include in your diet on a regular basis. Food scientists from Hampshire County Council tested various fast foods in 2008 and they found that the Doner Kebabs they tested contained as much as a wine glass full of cooking oil. One of the kebabs tested contained a staggering 140g of fat, which is twice the amount recommended for an average woman in one day. 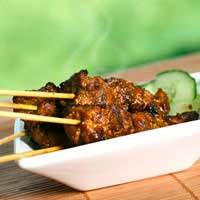 Nutritionists said that if people were to eat just two of these kebabs in a week, they would put themselves at a high risk of a heart attack. Most kebab shops also offer chips as a side order which pushes the calorie and fat count even higher. The equally well known Shish Kebab is widely available from most kebab hoses, and is originally an Iranian fast food delicacy. The term Shish Kebab comes from the Turkish for ‘Skewered Grilled Meat’. In Greece and Turkey a Shish Kebab is called a Souvlaki. The dish is thought to have originated when the Medieval Turkish soldiers used their swords as a skewer to cook the meat over an open fire.The typical Shish Kebab will be made from of cubes of chicken, lamb or other meat which are placed onto a skewer and then either grilled or roasted. It’s common to add a selection of vegetables, and the Shish kebab is one that can be easily customised to produce a healthier version of the meal. The fact that the kebab usually involves vegetables means that straight away it’s a healthier option that a Doner! In the same study that looked at fat contents in various fast foods, the Shish was found to be a much lower fat option than its fatty Doner cousin! Although it’s hard to put together a Doner kebab in your kitchen (and probably just as well) you can improvise using thinly sliced roast lamb in a pitta bread with shredded lettuce, onion and tomato. Or if you prefer the Shish option, try cubing and marinating chicken or lamb, then threading it onto a skewer with onions, courgette and peppers. You could even make delicious fruity kebabs with strawberries, pineapple, kiwi fruit and any other fruits, dipped in melted dark chocolate or yoghurt.